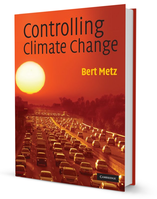 Controlling Climate Change, by Dr Bert Metz and published by Cambridge University Press, provides an unbiased and comprehensive discussion of what can be done to solve the problem of man-made climate change. It gives an in-depth overview of issues, useful for both students and professionals, while using a minimum of technical jargon, and is accessible to non-specialised readers as well as those involved in climate change policy. This accompanying website provides free access to chapters, the book as a whole, and related materials. Additional comments, publications, blogs on the topic, and links to climate policy developments will help readers understand the debate. What will happen if climate change is not controlled? What is the size of the challenge to keep climate change impacts to manageable proportions? How can this be accomplished while pursuing growth and development? What is the role of mitigation and adaptation ? What measures can we take in the main economic sectors, with current technologies and what do they cost? What policies are needed to make economically and technically feasible measures a reality? What policies work and do not work? What is the role of international agreements in controlling climate change? How do international climate negotiations work? The book is available in paperback, hard-cover and digital editions.